I have just spent two wonderful days doing two workshops with Gwen Marston. They were hosted by a local quilt shop in Toowoomba, 'Precious Time'. I have been so excited about these workshops. Who would have thought Gwen would come to my new hometown, one of the few priveleged places in Australia she decided to visit. As time got closer she had troubles with her visa and nearly didn't make it.... but she did! She is so wonderful and talented and such a lovely lady. Day one was a 'Liberated Medallion' class and I was the only one in the room to work with Repro's. 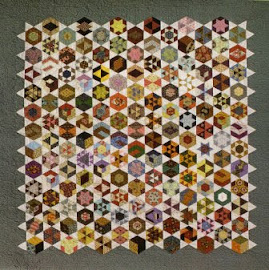 The liberated style means you can just add borders and chop them off if they are too long, similar to what some quiltmakers did years ago without wonderful rulers and cutting equipment. You can work a lot quicker if you don't have to work out measurements for blocks and join your points perfectly. Day two was called 37 Sketches' and Gwen showed us techniques she used to make her wonderful miniatures. Solid fabrics were used with an occassional piece of a feature fabric. Once again not much precise sewing, just having fun creating sections and then putting them all together. A very contemporary look, something new for me. I had a lot of fun making this one!